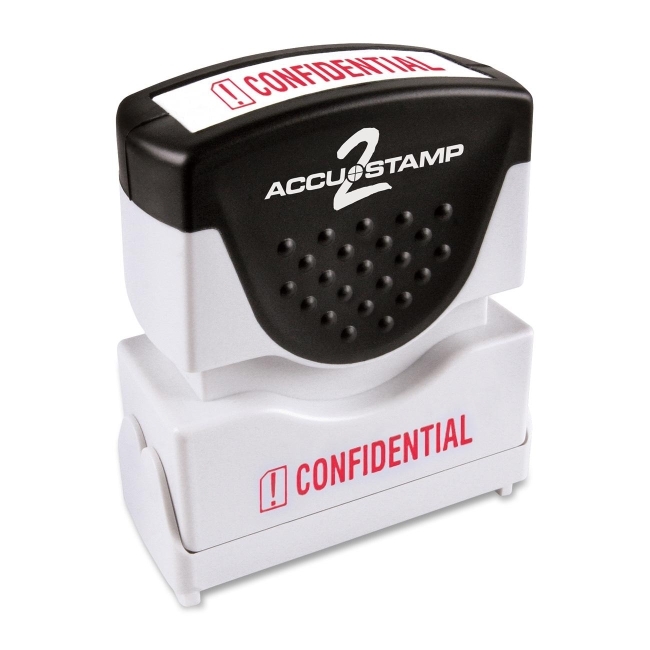 Accustamp 2 Shutter Stamp features Microban and a unique soft-touch grip for easy stamping. Microban antimicrobial protection works continuously to inhibit the growth of microbes, such as stain-causing and odor-causing bacteria. The textured grip on the ergonomically designed handle is made of rubber for your comfort. The frame is made of a sturdy plastic. To protect your stamp, a unique dust cover automatically opens and closes while stamping. For easy identification of your one-color stamp, the frame also includes dual-title labeling that reads "Confidential" with a red icon on the front and top. Shutter stamp makes thousands of impressions, and is re-inkable for thousands more. The stamp makes an average of 20,000 impressions. Actual stamp impression is 1/2" x 1-5/8".